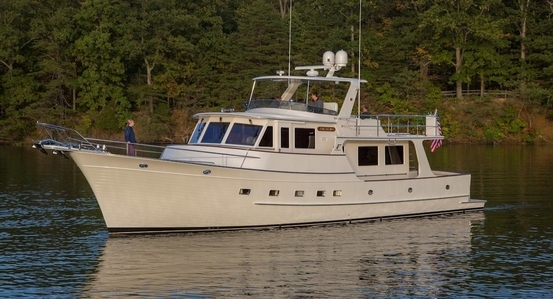 The Fleming 58's Price Is So Affordable For The Luxury And Convenience She Provides! 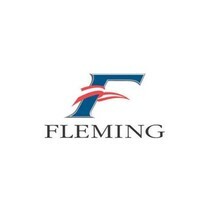 BMW is the ultimate driving machine, but Fleming… Fleming is the ultimate cruising machine. No, we are not the first ones to say this, the yachting journos and Fleming yachts owners - more than 220 of them, were the first to dub Fleming Yachts this way. Since their inception back in 1985, Fleming Yachts have set the bar high when it comes to the construction of cruising yachts which are capable of providing high-class luxury, best safety and top-notch yachting experiences on blue waters. 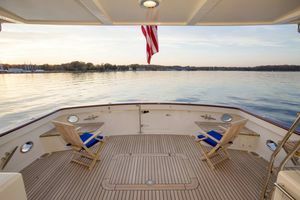 Fleming Yacht's founder, Tony Fleming, wanted to bring the best luxurious yachting experience in the lower price segment as well while at the same time keeping the core fun-to-navigate characteristics of smaller boats. The result was the Fleming 55 back in 1985, the Fleming 75 came to life in 1997 and the Fleming 65 was released in 2005. As for the successor of the most successful 55, Fleming waited for more than 25 years. The newest child bowed the world with an all-new design, an all new hull, all new technology and finally, an all new name. 2012 saw the birth of the Fleming 58 yacht, three foot longer than its 55 yacht predecessor, created starting with an empty sheet of paper but built in the same Tung Hwa boat yard in southern Taiwan where every Fleming yacht is created to this day. 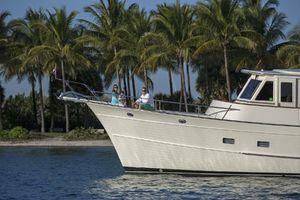 Starting with the Fleming 58's price, it is obvious that Fleming Yachts wanted to remain in their own price segment where only a handful of blue water yachts can provide so much composure, refinement and practicality. 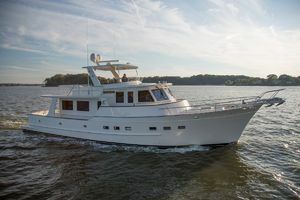 As a trawler, the Fleming 58 yacht continued to “walk on” the same principles as its predecessors. The first obvious clue for this are the exterior looks. Although she is truly an all new vessel, the Fleming 58's photos reveal her strong connections with the Fleming 55 and the Fleming 65. Obviously, the designers remained faithful to the classic yacht design which actually made Fleming vessels so popular. This was the best move the designers could pull off since the designing process and the interior arrangement could largely be taken from the 55 and improved, not imagined almost from scratch all together. This is a good thing because the Fleming 55 was highly praised for its commodities, roominess and adaptability for various uses. The 58, although only 3 feet longer, is actually radically enlarged inside. Her 17'6" beam is the biggest advantage over the smaller beam on the 55. Just because of this fact, designers were able to integrate an impressive array of commodities on the inside. The engine room (standing engine room that is) is bigger, the galley far roomier than before with more space in the passages and other parts of the ship. This, however, did affect the weight and the displacement of the ship. So much so that a fully loaded and prepared Fleming 58 for sale has a displacement of 105,600 lbs. Now, history showed that experienced helmsmen actually prefer heavier ships. They are far more stable, more comfortable and can handle heavy weather far better than lightweight vessels. True, large displacement usually cripples fuel efficiency, but in good Fleming spirit, the Fleming 58 range got increased to 2000 nautical miles thanks to her 1,450-gallon tanks. Twin Cummins 500hp engines sit in the engine room smartly separated by two fuel tanks from the lower deck with two staterooms and a guest cabin. Her shape, design and sheer layout are all full of small surprises conveying the message of refinement and utmost attention to details. We first have contact with her teak flooring happens at the transom stern where a fairly wide platform above water level greets visitors or passengers before they enter into the cockpit. 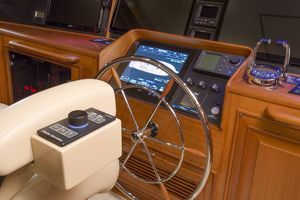 The cockpit is fairly simple in design with a few seating places, three closed storage compartments and passages to the engine room and flybridge. As usual, Fleming did all they could to integrate as much teak as possible in their boat design. This way the luxurious and fairly refined ambience is retained, but much more importantly, the dependability and the durability of the yacht remained at the highest possible level. Not only does one walk over a wooden floor all around, but also keeps his/her hands on a decorated wooden gunwale. As Fleming uses the best-known wood protection techniques, all the outboard wooden surfaces on the starboard and the port side are destined to last for an eternity. Used Fleming yachts are still in a great shape despite being on the seas for ages, and all that thanks to the top notch quality of all elements. As ever, corridors on the sides provide an exceptional link between the bow and the stern and it is quite fascinating to witness all the cleats, open anchor chain and many storage places elegantly integrated on the bow. 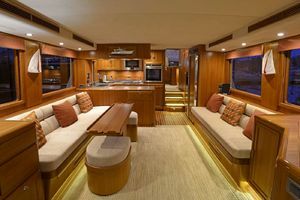 Yes, practicality is of the utmost importance for the Fleming 58 Motor Yacht, but once one enters the main saloon from the cockpit, boating ambiance immediately transforms into an almost hotel-like surrounding. A comfy sofa sits behind the dining table on the left-hand side directly looking at the beautifully styled, but seemingly empty furniture on the right. 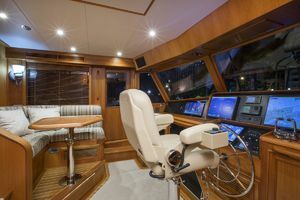 At the touch of a button, a slim LCD screen rises up at the corner from a furniture piece and provides much-needed entertainment for long nights at sea. 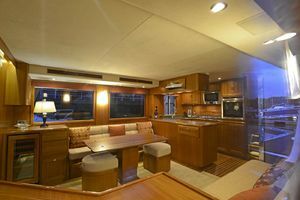 The dining table and the sofa provide enough room for six and, pleasingly enough, the main saloon is directly linked to the galley. This C-shaped galley is an astonishing piece of architecture which offers exceptionally well-arranged elements such as a microwave, double sink and even a large surface for serving or preparing dishes. The fridge is just where it is supposed to be - next to the passage and the stairs leading to the helm. 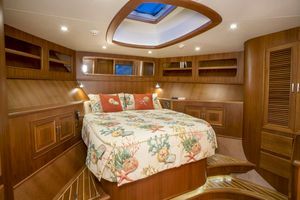 With lights and an LCD TV on and some activity in the galley, the Fleming 58 layout certainly feels like a luxury apartment which is without a doubt high praise for any boat. The stairs leading towards the main inside helm station (there is another one, but you’ll read about it a bit later) provide the first glimpse of the place where the captain or helmsmen will spend most of their time while traveling. With one or two seats at the helm, the ones in charge will have complete control of the yacht via a Glendinning EEC3 engine controlling system. 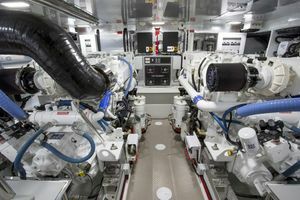 True, the entry level power source comes in the form of a twin Cummins 500hp engine setup, but for those who want more, Fleming is happy to integrate twin 800hp MAN diesel marine engines. The hull and the architecture can handle this power with ease. The Fleming 58's fuel consumption may suffer a bit, but her performance will rise considerably with this setup. Nevertheless, everything about the engines and ship control is well tucked away in the lower deck at the back. Most importantly, the engine room and the lazarette are easily big enough for a person to walk upright. Persons who are responsible for maintenance of the ship will appreciate such a design. The same story goes for the front part of the lower deck where all the magic happens. The main corridor can be reached via the stairs in the main helm station. Once again rigged up with nice wooden paneling and smartly tiled with teak, the main corridor leads to one of three cabins. 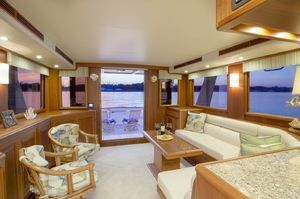 There is one guest cabin with two beds and this one shares its head with the VIP cabin located at the bow. A cozy atmosphere in the well lit and rather luxurious VIP stateroom is smartly translated to the smaller guest cabin. However, the most luxurious part of the ship is most certainly the master cabin with its own dedicated head, fantastic large cabinet and a five-star hotel room feel. It is quite impressive how Fleming and the team in Taiwan integrated all the necessary luxurious amenities to make the 58 feel far more advanced compared to the 55 she replaces. And yes, the new Fleming 58 layout offers another special feature that many of the world's greatest yacht enthusiasts will simply adore. 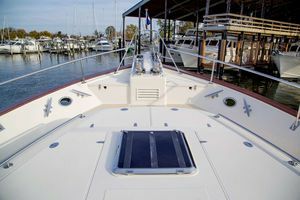 It has a flybridge deck (accessible from the cockpit or the main helm station) so vast it comes equipped with another helm station, an awesome flybridge lounge with an open grill (what more could you ask for) and an awesome ships tender, usually powered by a Yamaha engine. 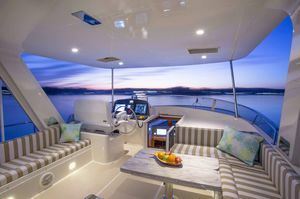 The well thought out flybridge is definitely the centerpiece with a sun protector all over the dining area and the helm station and a great entertainment system for epic night voyages on the seas. While the Fleming 58 is the newest addition to the small Fleming Yacht family, its core values and competencies follow all the ideas and the form Tony Fleming envisioned when designing his first yacht. She is stunning looking, carefully considered and planned, has an all new hull, is rather heavy and every inch is carefully crafted to provide the utmost best for her users. Should you want to find out more about the prospects of owning this magnificent boat, feel free to contact us. Mail us, ring us or make an enquiry on the web page following this link to satisfy the curiosity you undoubtedly have about this fascinating vessel. 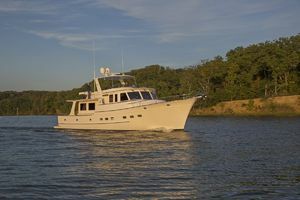 This Fleming 58 Yacht is an unconventional machine with her price just one call away. 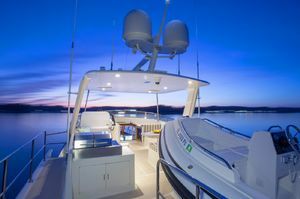 Alternatively, zoom through the Fleming 58 virtual tour provided below to grasp all the luxury, convenience and practicality she generously offers. This is a ship to be excited about, this is a ship whose ease of use, dependability, low cost of maintenance, and running cost will amaze even the sceptics. Anchor Platform accommodates dual vertical windlasses to handle the 100 lb (45 Kg) stainless steel Ultra anchor and 7/16" Acco chain. The wider pilothouse, has space for twin Stidd helm seats.